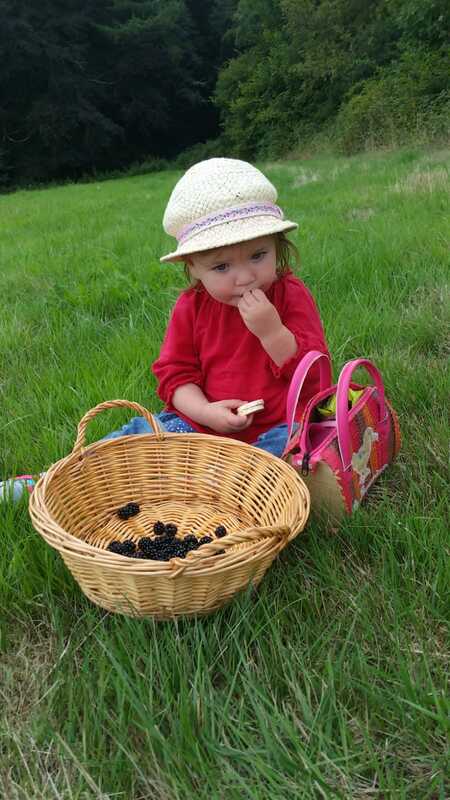 Around this time of year, there are just a couple of weeks when the late blackberries ripen and the last apples are ready to picked. That starry, seasonal alignment happened last weekend and I was determined to make the most of it. Making a fruit galette is usually my fail safe recipe to turn to when I lay my hands on exceptional bounty like this, be it figs, plums, or this time, apples and blackberries. The pastry used for galette is thin, crisp and buttery and plays a good supporting role to the fruit, rather than overwhelming it. The free-form shape also allows for a ‘stuffed crust’ – off cuts of the fruit can be finely chopped and tucked inside the folded crust, so every mouthful is a perfect balance of rich pastry and sweet fruit. “This simple free-form tart is the first recipe I’d teach any uncertain pastry maker. You don’t need a food processor or any fancy equipment, in fact the dough is best made by hand. 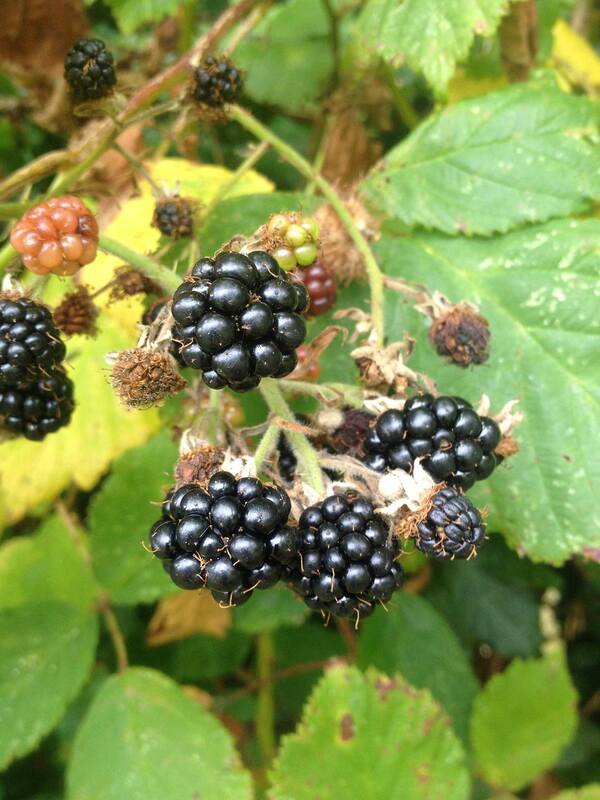 Last weekend I stumbled upon a bank of wild blackberries at the peak of ripeness. They were so ready for picking, they were starting to drop off the bushes. That same day, I’d gathered the last apples from the tree. Autumnal fruit flavour combinations don’t get better than this. This simple free-form tart is the first recipe I’d teach any uncertain pastry maker. You don’t need a food processor or any fancy equipment, in fact the dough is best made by hand. It requires the minimum of mixing, so the butter remains in large pieces, which create pockets of air when it cooks and give the pastry a brittle, flakey texture. The dough is pliable and easy to roll and you don’t need a tin. The apples, once sliced, need to be doused in lemon juice to prevent discolouration and some of them can be roughly chopped and laid around the edges for the pastry to be folded over them, filling the crust. I often put a layer of ground almond, mixed with a little butter and sugar underneath the fruit. The sweet nuttiness helps bring out the flavour of the apples. This I made in a pestle and mortar, grinding the almonds (skin on) to a powder and pounding the butter and sugar in the mortar with them until they became a spreadable paste. Roll the crust over the chopped apple and sprinkle liberally with caster sugar. This will give the cooked pastry an extra crunch. Slide it into the oven and bake for about 30 minutes at 190°C or until the pastry is crisp and golden. While it is cooling, you can make an easy glaze by putting the apple peelings and cores into a pan with sugar, water and a splash of Armagnac or brandy. Boil until thick, then pour it over the tart. To make the pastry, put the flour into a bowl with the salt, sugar and the butter. Using just the tips of your fingers, lightly rub the butter pieces into the flour until the mixture resembles very coarse breadcrumbs. Add the water, a tablespoon at a time, mixing lightly until the dough comes together. Press it into a disc shape, wrap in cling film and rest in the fridge for at least 30minutes or until needed. Meanwhile, grind the almonds (I do this in a pestle and mortar but you could either buy ready ground or use a food processor). Add the soft butter and sugar and mix to a paste. Set aside. Peel, core and slice the apples (keeping some of the peelings and cores) and anoint the slices with the juice of 1/2 a lemon to prevent discolouration. Finely chop about 2tbsp of apple for the stuffed crust. When the pastry has rested, lay it on a sheet of baking paper and dust with flour. Roll it out to about the thickness of a £1 coin, in whatever shape you choose – round, rectangle, square.. Spread the almond mixture in a thin layer over the pastry and arrange the apple slices on top, leaving a gap of at least 5cm around the edge. Lay the finely chopped apple in a line all around the edge of the pastry and roll the pastry over it, concealing it under the dough. 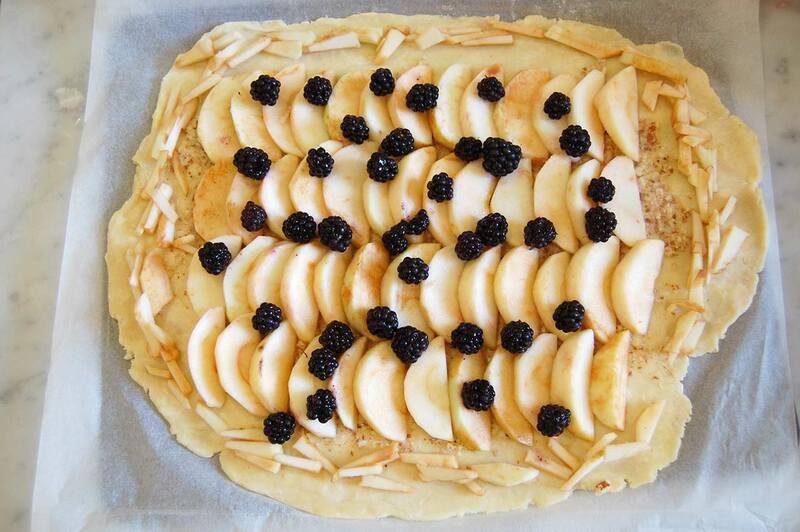 Sprinkle the blackberries amongst the apple slices. Dust the tart liberally with the extra caster sugar, especially over the crust – this will give it extra crunch. Place in on a baking sheet and bake for about 25-30minutes or until the crust is golden brown and crisp and the apples slightly coloured. While it is baking, make the glaze. Put most of the apple peelings and cores into a saucepan with 200ml water, sugar and the brandy. Boil to reduce to a thick syrup. Remove from the heat until needed. When the tart is ready, reheat the syrup glaze so it becomes liquid again and pour it over the cooked fruit. This is best served whilst still warm.